The ICIS PE Asia price forecast report, produced by the ICIS Consulting team, provides an ‘at a glance’ view of the market to support your short- to medium-term decisions. As well as providing a wealth of useful data on current and historical prices, the report includes the forecast prices for both Polyethylene and Ethylene to help you understand where prices are heading. In Asia, PE market prices remain highly uncertain due to upstream market activity and demand. Now, more than ever, you need price forecast information you can rely on to stay informed, to mitigate risk and maximise opportunities straight away. Producers, buyers, traders and end-users can all benefit from the ICIS PE Asia price forecast report. The ICIS Polyethylene (PE) Asia price forecast report features a concise, easy-to-read 4-page format that includes all the details needed to make confident commercial decisions within the Asian PE market. This report covers current and forecast prices, raw materials prices, supply, demand and capacity information, regional import and export data, trade flow forecasts, and margins. To discuss the methodology applied and to understand more about the forecasts, subscribers to the ICIS PE Asia price forecast report can talk directly to the report author – ICIS consultant, John Richardson. John Richardson has been tracking Asian and global polyolefins markets for 19 years in various roles – as a price reporter, news reporter, industry analyst and now as a consultant. During this time, he has built up an extensive network of contacts across the global industry, from junior to very senior levels. It is these always strictly confidential relationships with the market that John draws on for his prices and margins forecast work. He is responsible for the Asian Polyethylene and Polypropylene Monthly Price Forecast Reports. ICIS is the world’s largest petrochemical market information provider and has fast-growing chemical, energy and fertilizer divisions. Our aim is to give companies a competitive advantage. We deliver trusted pricing data, high-value news, analysis and independent consulting, enabling you to make better-informed trading and planning decisions. In November 2011, we acquired Parpinelli TECNON, an independent data and consulting business specialising in petrochemicals, feedstocks, energy, refining and specialty chemicals. Now with over 30 years of historical supply and demand data, as well as future data projections and scenarios through 2030, ICIS can help you explore future global supply and demand trends and improve your planning and research capabilities. ICIS Price forecasts are now available on the Dashboard channel using the Price Forecast Window. ICIS Dashboard subscribers who receive the price forecast report will be able to access monthly PE price forecast curves on the ICIS Dashboard with commentary from our analysts, alongside up to 12-months’ worth of historical prices. This window allows the user to chart the price forecast against the last (rolling) twelve months of related price history. In addition to this, users can plot the last 12 months of price forecasts too enabling them to see how the forecasts have progressed as time has moved on, as well as how accurate the ICIS forecast has been. Users can convert this data into different currencies and units as well as download this data into excel in order to easily enter into their own calculations. To find out more or take a trial . 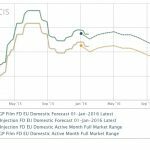 The ICIS Polyethylene (PE) Asia price forecast report is an essential tool in making buying and selling decisions. By subscribing to the report, you will be able to stay ahead of your competition by getting the information you need to assess the market in the short-to-medium term. How do market moves impact prices? ICIS offers independent and reliable pricing and market intelligence for the global petrochemical, energy and fertilizer markets. Covering more than 180 commodities and all major trading regions, we provide pricing information you can rely on to support your commercial decisions.